This is in response to the recent discovery that ART:I:CURATE has been producing and supplying unauthorised, fake copies of my artworks to fund their Kickstarter campaign. Their actions constitute a serious, unacceptable and unlawful infringement of copyright, as well as a complete breach of trust. As I believe the email correspondence presented here plainly demonstrates, ART:I:CURATE have been disingenuous and deceitful in their dealings with me. By openly publishing this material here, it is my hope that other artists, curators and art lovers will avoid finding themselves in a similar position, enabling them to make their own judgment as to the trustworthiness of ART:I:CURATE. I have subsequently also become aware of other accounts of ART:I:CURATE’s unscrupulous behaviour, with a number of fellow arts professionals having had similarly unpleasant dealings with the company. Whilst for now I am concentrating on the facts of my own experience here, I hope that this page will contribute to the the much-needed discussion about the exploitation of artists, curators and interns in the art world, and the potential pitfalls of online art platforms, encouraging others to publish their own first-hand accounts. In addition, since at the time of writing I’ve been unable to satisfactorily determine the full extent of ART:I:CURATE’s actions, I hope that this page will also serve to alert any other Kickstarter backers who might have received one of these fake prints. Apologies for the rather long-winded nature of the content of this site—all in the name of thoroughness and transparency—but hopefully there’s enough here to prove engaging and (oddly) entertaining, due to the sheer audacity and barefaced cheek of ART:I:CURATE’s behaviour. Back in March 2013, I was invited by ART:I:CURATE to join their newly-launched online art platform. Although the site’s founders have backgrounds in fashion and banking, and not the art world, I had initially been impressed enough with their apparent professionalism. Since I had a couple of good friends whose works were also featured on the site, I duly agreed to join up, contributing the same small online documentation jpeg photos that appear on my own website (which can’t be printed out at any great size). On 3rd June 2013, even before I had signed this agreement, ART:I:CURATE had asked me if they could use my image, The Ontic Order (II), on some postcards. Around 50 were to be printed and given away free of charge to some of their “special members”. I had no objection to this, and so provided them with a suitable image file. However, as I began to discuss this further with Christos (who, fortunately, turns out to be a really lovely and understanding chap! ), the truth of the matter began to emerge. Christos had received a print from ART:I:CURATE, purporting to be a genuine special edition art print of mine. This, however, was in fact a fake, crudely produced with the file I had supplied ART:I:CURATE for the postcard. Christos had acquired this print through ART:I:CURATE’s Kickstarter page. 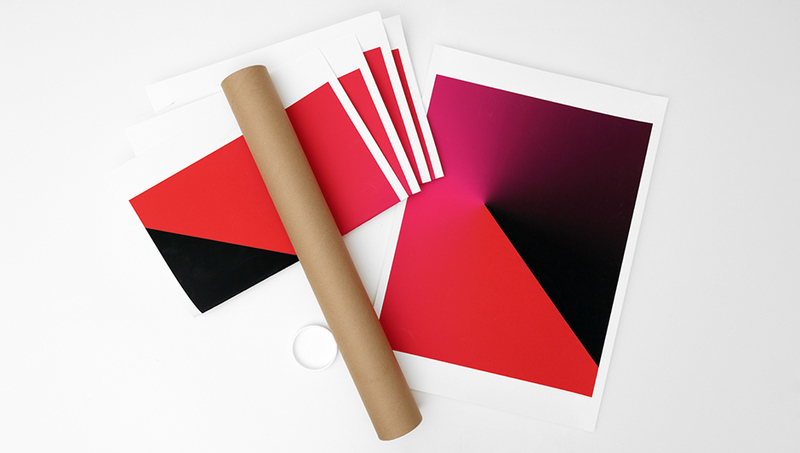 Here, such prints were being advertised as a “Special edition A2 art print”, included in a number of packages offered in exchange for contributions of between £75 and £1000. Christos himself had paid £350. In total, ART:I:CURATE’s Kickstarter page reveals that they raised at least £9,825 from 79 people through packages offering “Special edition art prints”. I may never know for certain exactly how many of these packages included the fake prints of my work, although I am hopeful that Kickstarter themselves will assist me further here. Christos agreed to meet a couple of days later to give me the print. I had been expecting this to be some sort of flimsy poster, but it was, to my horror, a professional looking—though poorly executed—print on heavyweight fine art type paper. (See the photo at the top of this page.) There was no doubt that this was being passed off as the real thing, plain and simple. Christos also kindly provided me with the original email that ART:I:CURATE had sent him after his Kickstarter payment, in which my print (as well as those of two other artists) was offered, alongside a photo of the original, genuine artwork. I was gobsmacked to see that this email was dated 24th May 2013, which is a full 10 days before ART:I:CURATE first requested the postcard file from me, confirming the full scope of their deceit. Again, I have copied this Kickstarter email here. ART:I:CURATE’s response to all this has been utterly shameful. I have given them every opportunity to try to put things right, but they have completely failed to acknowledge the seriousness of their actions, and have repeatedly refused to provide me with all the information and answers I need in order to attempt to repair the damage they have caused. There are numerous examples of their ridiculous lack of professionalism evidenced in the email correspondence presented here. At one point, they attempt to fob me off with some nonsense about Kickstarter’s terms of service (which they have clearly breached themselves), disingenuously attempting to assert that the prints were “promotional gifts,” and that “there has been no sale, invoicing or transaction in any relation to your work”—as if this would somehow justify them producing and supplying these unauthorised prints. Furthermore, they point to the inclusion of the words “Copyright Luke Turner” at the bottom of the prints as in some way legitimising the use of my image. As they should be well aware, this is obviously not how copyright law works, and such an action is effectively tantamount to forging my signature. ART:I:CURATE even tries to argue that these illegitimate prints have somehow increased the “visibility and value of your work,” and, most preposterously perhaps, they let me know that “it was actually a cost to the company to produce these materials.” You couldn’t make this stuff up. My most pressing concern now is to find out exactly how many of these unauthorised prints were made, and to account for them all. Pinning ART:I:CURATE down on this matter has been particularly painful, with them originally stating simply that “a few prints were made”, before eventually informing me that they had four in their possession, which they have now posted to me (pictured at the top of this page). However, given ART:I:CURATE’s attitude, I have no reason to take their word for it that these are the only prints in existence. Worryingly, despite my repeated requests, they have refused to confirm or deny whether prints of other sizes were ever made or supplied, which obviously leads me to fear that this may in fact be the case. In conclusion, given my experience, I would personally advise everyone to give a wide berth to ART:I:CURATE. Frankly, I’ve needed all this like I need a hole in the head, and getting to the bottom of their mess has already taken up far too much of my time. I do think it’s important, however, that I speak out, and I’m very grateful if you’ve managed to read this far. I’d also appreciate it if people could share this page with anyone it may be of relevance to, to try to ensure that this sort of thing is never repeated. However, I have absolutely no intention of giving out any false information to destroy their reputation. They’ve just gone and done that themselves.